I was having the same problem. I forced stopped the hub. cleared the cache for both the hub and bbm, restarted phone and it seems to have fixed it for me. I have noticed the same. But it is intermittent. when you say "split screen" do you mean that it includes the outgoing and incoming? I will try same if I can figure out how to do that! I decided to join the BlackBerry Beta program and install the latest beta apps to see if this solved the problem. The same thing is happening, so the issue may actually be with the December OS update, not the apps themselves. This is most unfortunate. The OS and the Hub are not talking right to each other. I'm on the Dec update with the beta apps. No issue. How does one get in on that. Still having a problem inspire of the recommendation of a forced stop and a cache clear. same HUGE problem here.. new key2 64gb, set it up.. in put email ad and account info.. updated all apps.. worked great, updated the os, now nothing shows in hub, from texts, to bbm to email notifacations. deleted email account, have all the settings saved, and have yet to wipe my dtek60 with all settings data.. (same as what i originally input). now i when i gottot create my email account with all the correct data.. the NEXT icon is greyed out... i cannot proceed after inputting the incoming server etc..???? any ideas?? this happened last night after taking the os update..
"We apologize that we couldn’t provide you with a solution, we only support BBM (Messenger) apps in Android and iOS phone." I explained that the Key 2 is am Android phone. 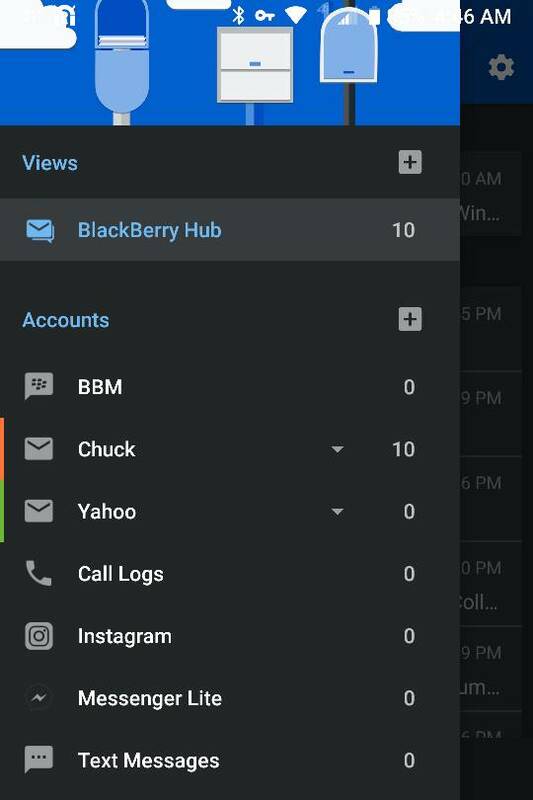 It seems to me that BBM should work seamlessly with the Hub, another BlackBerry app on a Key 2, a BlackBerry phone. This is really sad. I believe it was taken out with the latest update. @LiamQ can you confirm that? BBM shows up in my Hub. See screen shot. Have you checked "Permissions" ? Still in my KEYone hub. Same... BBM is still showing in my Hub as well. Maybe it's the matte surface of the keys causing the problem. Bob80220 and moosbb like this. For some unknown reason it started showing up...how odd! If the HUB can no longer integrate BBM messages live, how is BlackBerry going to integrate Cylance, a $1.4bn company? We can get BBM messages into the Hub: first open BBM app, click on the new message received and read it, then go into the Hub, you'll see it then. "Et voila !" ("There it is"). Too many parties involved, no one held responsible any longer. Having same issue on both mine and my wife's motion since we installed the latest Hub and BBM updates last week. They could have been pending updates for some time. We install them manually when we remember. I've been having this problem for at least a few weeks. Is there a fix? Strange so many having this issue as I found I kept deleting the bbm msgs and they kept coming back. So finally I just deleted bbm. Stopped using it after leaving bb10. Tried to kind of keep it but pretty useless for me. I have BBM in my Hub. I am on the March update and the new version of the Hub. How can we have this fixed? On top of having random BBM messages not showing up, hitting the compose and BBM function doesn't do anything anymore. I've tried sending an email to customer support but you need a subscription number. Do not have one since I have a Key2. We need someone at BlackBerry to solve this asap! My wife has an LG and has no issues.